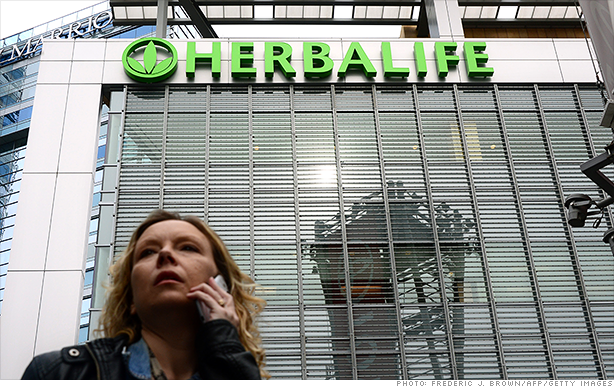 Herbalife shares fell after the company disclosed its being investigated by the FTC. "Herbalife welcomes the inquiry given the tremendous amount of misinformation in the marketplace," the company said in a statement. "Herbalife is a financially strong and successful company, having created meaningful value for shareholders, significant opportunities for distributors and positively impacted the lives and health of its consumers for over 34 years. " The company has been heavily scrutinized ever since hedge fund manager Bill Ackman first called Herbalife (HLF) a pyramid scheme more than a year ago. Ackman's Pershing Square Capital Management hedge fund has a $1 billion bet the company's stock price will fall. So far, the trade has not worked out. Even with the big drop on Wednesday, Herbalife shares have soared 50% over the past 12 months, leading to significant paper losses for the fund. Ackman and Pershing Square declined to comment about the FTC probe. Carl Icahn bought a large stake in Herbalife in early 2013, not long after Ackman launched his attack. The two traded insults in a memorable exchange on live TV last year. Just Tuesday, Ackman unveiled new evidence Tuesday that he said shows Herbalife, which sells nutritional supplements through a network of independent distributors, is operating in violation of Chinese law. Ackman argues that Herbalife makes its money by selling products to distributors, who in turn sell to other local sales people, rather than actual end users. He has accused Herbalife of targeting Latinos in the U.S. as an attempt to exploit immigrant communities. According to a report Monday in the New York Times, Ackman has actively lobbied members of Congress to support his cause. He's also funded letter-writing campaigns and grass-roots groups against Herbalife, the paper said. Previously, the FTC has said that multi-level companies would be deemed an illegal pyramid scheme if salespeople sell more products to other distributors rather than to the public or if they make more money from recruiting than they do from selling products. The concern is that lower-level distributors may be stuck with unsold products. Herbalife rival USNA Health Sciences (USNA) fell over 6% on the Herbalife probe news. Like Herbalife, the stock has enjoyed a big run, surging 45% in the last year. Beauty products marketer Nu Skin Enterprises (NUS), which has been accused of making bogus advertising claims by the U.S. Federal Trade Commission, bucked the trend. Its shares were up 4% in late trading Wednesday after falling initially on the Herbalife news.